Karani was selected by CRN because of the leadership role he played in Quick Heal’s expansion into the North American market last year with the Seqrite line of cloud-enabled network security solutions. Quick Heal Technologies today announced that CRN®, a brand of The Channel Company, has named Farokh Karani, Director, North America, Sales & Channels, to its prestigious list of 2016 Channel Chiefs. The executives on this annual list represent top leaders in the IT channel who excel at driving growth and revenue in their organizations through channel partners. Karani’s Channel Chiefs profile can be found online here. Channel Chief honorees are selected by CRN’s editorial staff on the basis of their professional achievements, standing in the industry, dedication to the channel partner community and strategies for driving future growth and innovation. Each of the 2016 Channel Chiefs has demonstrated loyalty to and ongoing support for the IT channel by consistently promoting, defending and executing outstanding channel partner programs. Karani was selected by CRN because of the leadership role he played in Quick Heal’s expansion into the North American market last year. With Karani’s guidance, Quick Heal Americas established a fast-paced North American channel program anchored by Seqrite, a comprehensive cloud-enabled line of network security solutions directed at the small- to medium-size enterprise market. In the past year, Karani has spearheaded several Quick Heal distribution agreements spanning the U.S. and Canada, with more IT channel alliances underway. 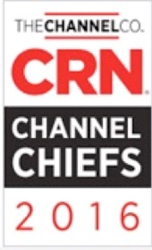 The 2016 CRN Channel Chiefs list is featured in the February 2016 issue of CRN and online at http://www.crn.com/channelchiefs. About Quick Heal Technologies Ltd.
Quick Heal Technologies Ltd.’s Seqrite data security product line targets small-to-midsize enterprises (SMEs) and is designed to simplify security management across endpoints, mobile devices and networks. For more information on the Quick Heal Seqrite Partner Program, please contact 855-978-6117, email us at us.sales(at)Seqrite(dot)com or visit the Quick Heal partner page. For more information on Quick Heal, visit http://www.quickheal.com. CRN is a registered trademark of The Channel Company, LLC. The Channel Company logo is a trademark of The Channel Company, LLC (registration pending). All rights reserved.